No DRM, Creative Commons and in every format: plain text, pdf, html, ePub, mobi, azw for Kindle, prc, ... every one. 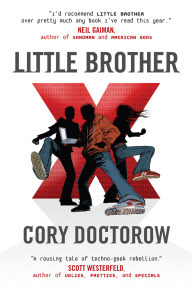 "Little Brother is a scarily realistic adventure about how homeland security technology could be abused to wrongfully imprison innocent Americans. 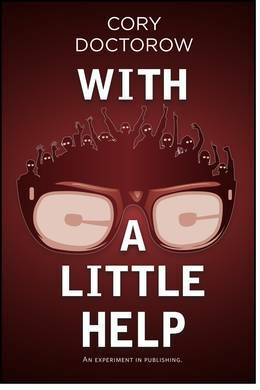 A teenage hacker-turned-hero pits himself against the government to fight for his basic freedoms. 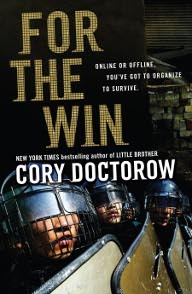 This book is action-packed with tales of courage, technology, and demonstrations of digital disobedience as the technophile’s civil protest"
Seventeen-year-old San Francisco native Marcus Yallow and his friends Darryl Glover, Vanessa "Van" Pak and Jose Luis "Jolu" Torrez are truant from school and playing an alternate reality game, when a terrorist attack destroys San Francisco Bay Bridge. Air raid sirens sound, and everyone in the area begins swarming toward a fallout shelter. Darryl is stabbed by someone in the crowd and the others try to find help for him, but since they didn't go into the shelter as expected, the foursome are apprehended by the Department of Homeland Security (DHS) and held as enemy combatants. 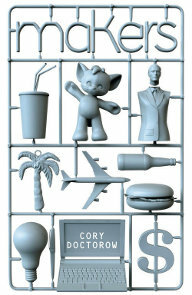 My favourite Amazon review, by R'lyeh says this: "Cory Doctorow has managed to create a wonderful fusion of science fiction, action novel, political thriller, and whimsical romp. It's very hard to bring those elements together, but he has succeeded admirably. I haven't seen anyone pull this off since "The Long Run" by Daniel Keys Moran"
From my point of view, the most interesting thing about this book is that it shows the struggle that we all maintain between our desire to feel safe and our need to be free and how all states seek to exploit the fear and helplessness that we feel sometimes in order to convince us to give up basic rights such as privacy and freedom of speech. Download Someone comes to town, someone leaves town. Download Down and Out in the Magic Kingdom.